Do You Want Your Own Antiques and Collectibles Business? Are You Looking For Interesting Items For Your Collection, Or To Sell On eBay? Learn How To Get A Constant Stream Of People To Sell You Their Antiques and Collectibles. This Proven System Will Make Your Phone Ring With Anxious Sellers Of Antiques and Collectibles You Can Sell On eBay. It used to be you could attend swap meets, flea markets and yard sales and you would find collectibles. Basically, you could just drive around on Saturday mornings and buy stuff. You can't do that anymore. Sure if you go out enough you will be lucky and find something. But luck is not something you can count on. If you want to buy antiques and collectibles regularly, you need to figure out how to get people to call you. Maybe you have tried a simple classified ad in the newspaper and were disappointed, or spent a few weekends driving around looking at yard sales with no luck. Luck is not good enough. You need a system. With my system you will make people call you and offer you their items. Hi, my name is Terry Gibbs. 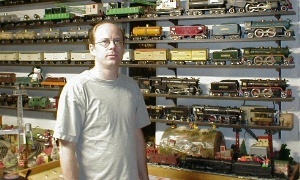 I buy and sell collectible toys and trains for a living. My father and I first became organized collector/ dealers almost 30 years ago. We would buy everything we could find and keep only the best for our collection. When my father and I started building our train collection 35 years ago, we built it the way everyone did. We went out and bought trains, then kept what we wanted and sold the rest. Everyone used to do this. Unfortunately, today many collectors believe that they cannot find trains or old collectibles except in stores or on eBay. Years ago I figured out that if I wanted to continue buying trains from the public I needed to find new ways to get them. I needed a system to make my phone ring with ready sellers. With trial and error, I learned what works and what doesn't. My system was born. Once A System Is Started, It Runs Itself. Like any system, you will need to monitor it and adjust it to keep the system running smoothly, but having a system is the ONLY way to get consistent results. I developed my strategies so I didn't have to rely on blind luck at yard sales. Using a system is actually easier than driving around blindly. You don't have to get up in the early on the weekends, people will call you every day of the week. You can set your own schedule. 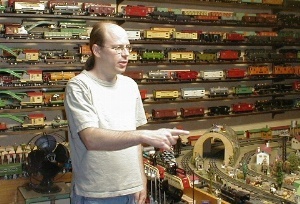 I get calls almost every day, and buy a few train sets every week. You Can Do This. My simple easy to implement strategies will have your phone ringing within days. I guarantee it! Use my system for 60 days and if you are not happy with it I will return your money. More on my No Risk Gaurantee later. My strategies will provide you with a constant stream of anxious sellers. Not only will you get my strategies to make your phone ring, but you will also learn my methods of persuading people to sell. I buy over 90 percent of the stuff I look at. So will you. You won't have to worry about the competition beating you out, because with a few simple words you can force people wait for you to look at their collectibles before selling. You’ll learn to get the seller to take your offer without shopping for higher offers. I will show you step by step how to get the seller to believe your offer is the absolute most anyone will pay. They will be happy to sell to you. Anxiously Happy. This System Is So POWERFUL, People Will Dig Stuff Out of Their Closets And Attics, Then Beg You To Buy Their Unwanted Treasures. Because I want you to be successful with my system, I have provided you with everything you need to get started on the right path. I guarantee it. Why run around in a blind search when you can do something else while waiting for your telephone to ring with someone offering you their collectibles? Would you like to get a call every day? How about a few calls a day? You Will Be Constantly Buying Antiques And Collectibles With This Easy to Implement System. Imagine paying $235.00 for a boxed Lionel train set, and then discovering it is an even rarer Department Store Special worth over $2500.00? Picture yourself bringing home some long forgotten collectible that was packed away for 35 years in someone's closet or attic. I like to sit and read the old newspapers the trains were wrapped in. Sometimes you can even sell the old newspapers! Consider buying a dusty box of junk out of someone's back yard for ten dollars and while driving home finding a small box of Old Army Medals worth thousands of dollars buried in the bottom!!!! Can you see your self pulling a dusty box from an elderly woman's attic because she is too wobbly to go up the ladder herself and discovering a $2000 train set? How about filling the back of a pickup truck and having to go back for another load? Or even renting a U haul truckto cart off the haul? Would you like to pick up a box of old books a woman was throwing out after buying some other items from her, and finding a 380 year old bible in the box? All of the events listed above happened to me in the past five years as a direct result of my strategies. This system will work for you. There are people all over the world making money buying and selling antiques and collectibles. Now you can join them. You won't have to spend years learning their secrets. You will make more than the price of my system in the first week of using it. Now, maybe you are thinking my strategies are just common sense. They are simple methods I developed to make my phone ring. That's the brilliancy of my system. These strategies are so simple anyone can do them. I have a hard time doing anything that's complicated for long. Why be difficult, and have some over-complicated, time consuming mess to deal with? The whole idea is to make your phone ring while allowing you to do other things. Play with your kids, work a "real" job, whatever you want. A system should run itself with little oversight. Don't confuse complication for effectiveness. These strategies are so powerful they will amaze you. A simple thing I do that costs less than $3.00 per month causes me to buy twice as many toys and trains when I use it than when I don't. Need I say that now I always use it? You'll learn this, and many more strategies just as powerful. I will show you how to get into the sorting rooms of thrift stores. No more shopping with the rest of the people hoping to see the donations first. This simple method will have thrift stores calling you whenever they get something you want. Along With My Strategies Manual, You'll Also Get My Marketing Toolkit. I gathered up all the different marketing pieces I have used over the years and put them together in the Marketing Toolkit. This folder contains the ads and marketing materials I use to find trains. These are the actual pieces I use to make my phone ring with anxious sellers. You can use them as is, or modify them to suit your needs. They are Microsoft Word Documents so you will need MS word to modify them. The Marketing Tool Kit has lots of effective ads and letters I developed over the past 23 years. It also has voice mail scripts, the complete text of the letters I use to get into the sorting rooms of thrift stores, signs, flyers- everything I use to get people to call me and sell me their trains. If you have ever paid a graphic artist to put together an ad you know this resource alone is worth the cost of my system. I want you to succeed with my system. I know it will work for you and to assure it will work, I will personally help you get started. If you can see this you will get an ad critique. I will remove this bonus without notice, so act NOW. Complete instructions for the ad critique are on the Critque.doc page in the Marketing Tool kit folder. Collectibles are older items hidden away in closets attics and garages. Collectibles are old baseball cards, postcards, dishes, Barbi and other dolls, Hot Wheels and Matchbox cars, toys, books, and other small items found in people's homes. Antique dealers call these items smalls because they are small items. They are perfect for eBay because they are easy to pack and ship. Collectibles Are Not Cheap Mass Produced Garbage From China. The only way to get collectibles is to buy them from the owners. You won't find them in a catalog, or a list of drop shippers, You have to dig them out of people's homes. That is what I do for a living. I go into people's homes, and buy their trains and toys. You can do it too. You will learn how to get people to call you and beg you to buy their collectibles. I will also teach you how to act when you are in the seller's home so they jump to take your money. Do These Strategies Work With All Types Of Antiques And Collectibles? Yes and no. All the ads and marketing items in the marketing tool kit are for trains and toys. They are the actual items I use. You can modify them to fit your needs for other types of collectibles or use them as models to create your own marketing. Use Your Free Ad Consultation To Help You Modify One of These Ads. Obviously, some types of collectibles will be easier to find. Families tend to keep trains and pass them on from father to son. There are still lots of trains out there. Same thing for dishes and many other types of collectibles. Most items are more common than you might think. Some collectors are interested in odd hard to find items. These strategies work very well on odd collectibles. I'm working with a guy right now who collects coin operated things like slot machines, and old trade simulators like pin ball machines that pay off in gum or something else. He has been having a hard time finding these old machines because they were used in bars and the owners didn't keep them when they broke or were replaced. I know he won't find them at yard sales. I do know many other strategies that may work. In fact, in the first week, I helped him find a neat old wooden baseball machine. If my strategies work for him they will work for you. You will be able to use many, if not all, of my strategies to find the items you collect. Some of the strategies are designed around trains and old toys so you will need to modify them. 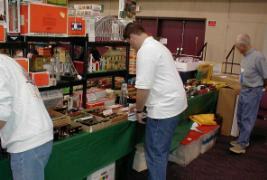 All you need is a desire to be in business for yourself and a basic knowledge of collectibles. If you don't have knowledge about collectibles you will gain it over time. We all have to start from somewhere. Quick Start Guide Instructions for buying antiques and collectibles now. Step by step checklist to get you started in the most efficient way. If you are already buying antiques and collectibles regularly this guide will help you double your purchases fast. This is an e-book readable on any computer. How To Get A Constant Stream Of People To Sell You Their Antiques and Collectibles. 83 Strategies To Make Your Phone Ring With Anxious Sellers. The Big Strategies Manual. Every one of the 83 strategies explained in simple terms so you can easily implement them. One of these strategies doubled my purchases overnight for only $3.00. The meat of the system. This is an e-book readable on any computer. Marketing ToolKit	I took all the different ads and marketing materials I use and put them together in one folder for easy reference. The Marketing ToolKit contains ads and letters you can use as is or as models when creating your own materials. The Marketing ToolKit also contains a voice mail script, the complete text of the letters I use to get into the sorting rooms of thrift stores, signs, flyers- EVERYTHING I use to get people to call me and sell me their trains. You can use your FREE Ad Consultation to modify one of these ads. Note: These are MS Word Documents. You need Microsoft Word to use the materials in the Marketing ToolKit. Bonus FREE Ad Critique and Consultation	For a limited time, I will critique one of your ads. In my critique, I will show you how to dramatically increase the response to your advertisement. This FREE CRITIQUE offer is only available for a limited time. If you can see this, you will get a critique. Use your critique to modify one of the ads in the Marketing ToolKit or as a consultation to get help with one of your own strategies. Complete instructions are in the MKT folder under the name critique.doc. A $200 value. Note: The original printed version of this package released in 2001 contained only 67 strategies and sold for $229.97. Because the cost of ebooks is so much lower than printed manuals, you'll get the larger updated package for only $49.97. That's a savings of $180. Get Started Now For Only $49.97. This System Will Pay For Itself With Only One or Two Purchases. These Materials Are E-Books. After paying by PayPal or a debit or credit card, you will download the books and view them on your computer. These are PDF files and work on any computer. You'll need Adobe Acrobat reader to view the books, but you can download that free. There is a link on the download page to the Adobe website. You can pay with any Credit Card or Paypal and Download the materials instantly. No waiting. Use the link below to pay. A charge for $229.97 $49.97 will appear on your credit card under the name "IWantCollectibles LLC." After you pay, you will be taken to a page with complete instructions for down loading and viewing the materials. Due to the size of the print quality materials included in the Marketing ToolKit, it may take 5-8 minutes to download the materials with a dial up modem. If you are not satisfied with my system for any reason just let me know within 60 days and I will refund your money. It is that simple. I am sure my system will work for you, but if for some reason you cannot make a go of this simple information, just send me an e-mail and I will refund the purchase price in full.